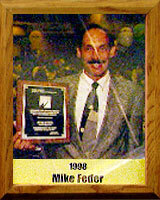 Mike Feder, General Manager of the Tucson Sidewinder Baseball Team (formerly the Tucson Toros), has been active in sports for many years. He lettered in baseball in high school, holds a teaching degree in physical education from college, has held general manager positions in professional baseball since 1974, and has coached Little League teams throughout the United States. As Vice President and General Manager of the Tucson Toros for nine years, attendance records skyrocketed to more than 300,000 fans for each of six seasons, including a franchise record 317,347 in 1991. He has captured five “Executive of the Year” awards in four different leagues. His general manager stints include Burlington and Davenport, Iowa; Wausua, Wisconsin; Cocoa and Daytona Beach, Florida; and Jackson, Mississippi.